History - Sal's Pizza Style Inc.
Sal’s Pizza Style has been serving Birdsboro and the surrounding areas since January 1st, 1987. Luther Crosby was my first customer, as well as a long-time friend of mine. For years, Luther patronized Sal’s Pizza Style until he passed away in 2014. 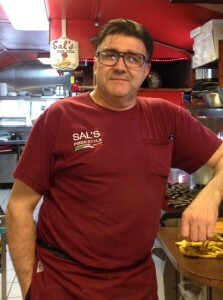 Today, his family and friends continue to support Sal’s Pizza Style and I am very thankful for their customer loyalty and friendship. Long hours, hard work, and loyalty brought Sal’s Pizza Style to where we are today. When I first started, Sal’s Pizza Style was open everyday of the week and I worked from 7am often until 1am, when we closed. I had to get up very early to make the fresh bread and prepare everything else for the day ahead. The restaurant business is very hard work and working in the kitchen makes it very HOT work as well – but I LOVE IT! I love making and creating new foods for my customers, who I am glad to call so many my friends as well. Since our opening day, I’ve created the Cheese Steak Pizza, Cheese Steak Stromboli, Crostata Grandma Pizza, Chicken Cordon Blue Pizza, Chicken Parmigian Pizza, the Sal’s Style Calzone Subs, the Leave it to Sal Sandwich, the Garlic Shrimp Dinner with Clam Sauce, Sal’s Shrimp Scampi (with Mushrooms, Fresh Garlic, Diced Tomatoes, and white wine sauce), the Garlic Cheese Steak with Garlic sauce, and my newest creation for September 2015: the Stromboli Pizza – it’s an Italian Stromboli with sauce and mozzarella on top, with toppings of your choice just like a pizza. This item is extremely popular; try one today! Our menu grows larger every year with great new Pizzas, Strombolis, Sandwiches, Delicious Pasta Dinner, and Salads. Our small Italian-style dining room seats 25 people on a first come, first serve basis. Our food is made fresh to your order daily, eat in or take out. We specialize in homemade cooking, daily pizza dough, and a variety of sauces. We use Impoted pasta from Italy and we cook it to perfection fresh on order. Home-style Meatballs simmered in homemade sauce and our lightly breaded Eggplants & Chicken Parmigiana served with side Spaghetti – what a way to say Mangia Bene (Eat good)! Our sandwiches are made fresh to your specifications. The Italian Sub with Ham, Genoa Salami, Provolone Cheese, and Spicy Capicolla – what a mouthfull! Our Cheese Steaks we make with or without. Try my Garlic Cheese Steak – very good and tasty. We make Italian Style Soups, like Pasta and Piselli (Peas), Chick Pea Soups, Chicken Cacciatore Soup, Zucchini Soup, Wedding Soup, and much more – call in to check the soup of the day! To compliment your food, we also offer hot and cold beverages – sorry, no alcoholic drinks! Our beautiful town of Birdsboro is the nicest town I have lived in since I came to America in 1976. I am very glad to be a part of this town, with the nicest and friendliest people around. We are only a few miles from French Creek State Park and the St Peter Village. To know more about Birdsboro, visit http://birdsboropa.org. I WANT TO THANK GOD for giving me the good health and the opportunity to serve your Grand parents, your family, your kids and your grand kids.